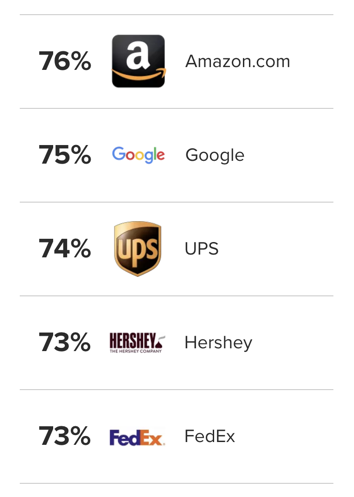 It’s no secret that Amazon is dominating the e-commerce industry. It has made shopping super convenient for people around the world, but for an independent e-commerce retailer it can feel more like the playground bully—aggressively competing to control the entire online shopping world. Sure, they’ll let you in on the action, but then you’re at their mercy with high sales commissions, shipping and storage fees, and strict, unforgiving policies. But Google’s changing that to help big brands and small brands alike fight against the Amazon machine. So what’s their latest tool to help independent retailers wrestle more customers away from Amazon? 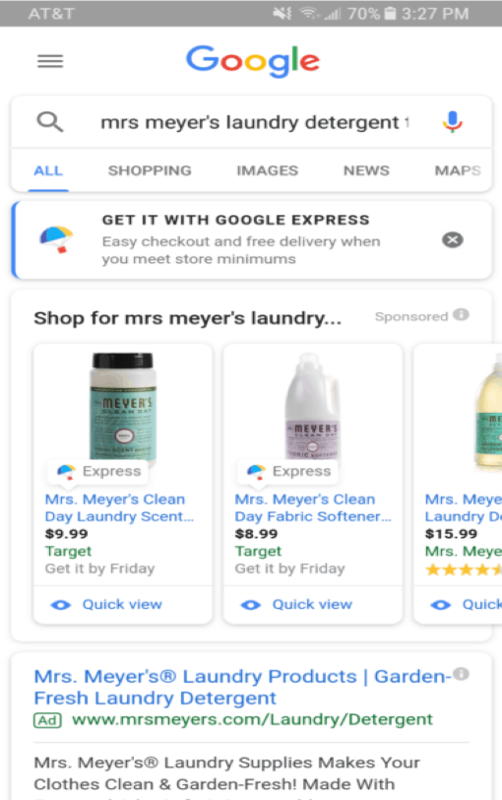 Formerly known as Purchases on Google, merchants are trying to understand the recently rebranded Google Shopping Actions. Google Shopping Actions was created as a response to Amazon’s grip on the retail industry. 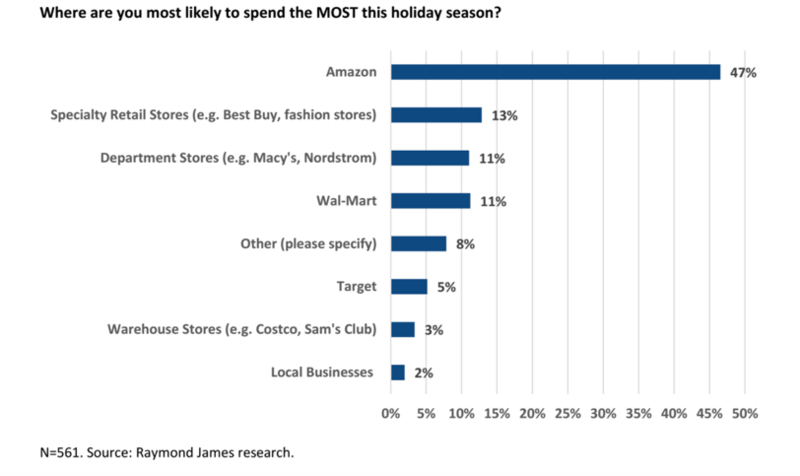 As you can see in the image below, the majority of consumers polled planned to spend the most on Amazon during the holiday season. 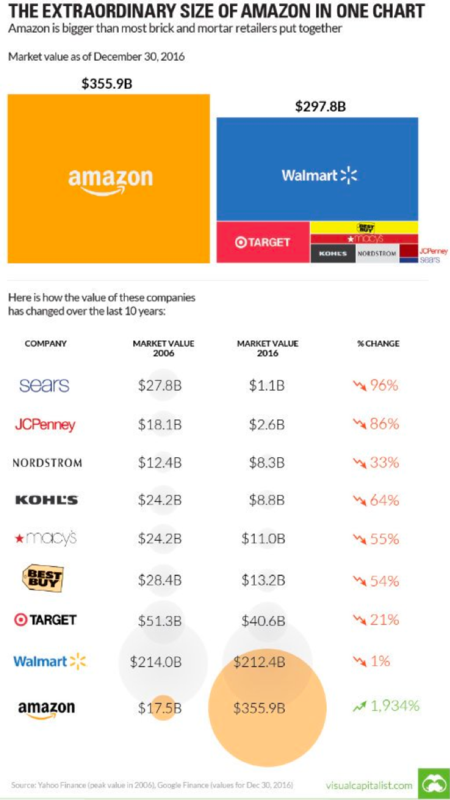 Amazon is now larger than 10 of the country’s largest retailers combined, including Walmart, Target, Macy’s and Best Buy. And they’re only growing. Using these tried and tested techniques Amazon has grown stronger, becoming the hub for customers to do one-stop shopping for everything. 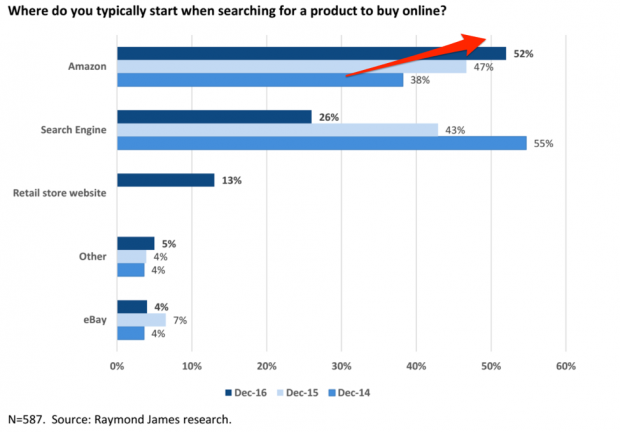 And as Amazon grows, they gain more leverage over third-party sellers on the platform. Already sellers are paying an average 15% commission. That’s after membership fees and before fulfillment fees, which are almost required if you plan to compete on the platform with Amazon Prime eligible products. But as retailers grow more dependent on them, there is no guarantee that Amazon won’t raise these costs. Oh wait, they are. As Amazon grows its monopoly on merchants, Google has quietly been tinkering and experimenting with their own marketplace. Google certainly has its own interest in mind and they know that Amazon is their biggest competitor moving forward. 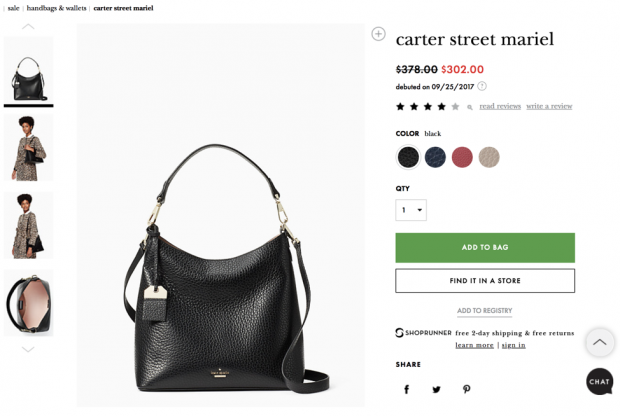 But they also know that if they want to compete, they need to create a better e-commerce experience for online shoppers the same way that Amazon did. And they know they need to work with third-party sellers to make that happen. 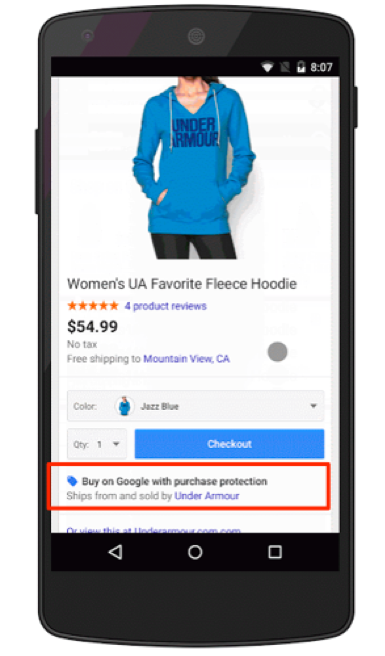 Let’s focus on their latest and most aggressive innovation yet: direct sales with Purchases on Google, now known as Google Shopping Actions. The goal is to make shopping on Google as seamless as shopping on Amazon, with the added benefit of also providing the buyer with all the valuable information and resources that only their search engine can. By addressing the same consumer issues as Amazon, Google appears ready to take on the e-commerce behemoth. Amazon is the first place many customers go first when looking for products yes, but there is still a lot of research that takes place on search engines (and by search engines, I mean Google), which accounts for nearly 75% of online search worldwide. 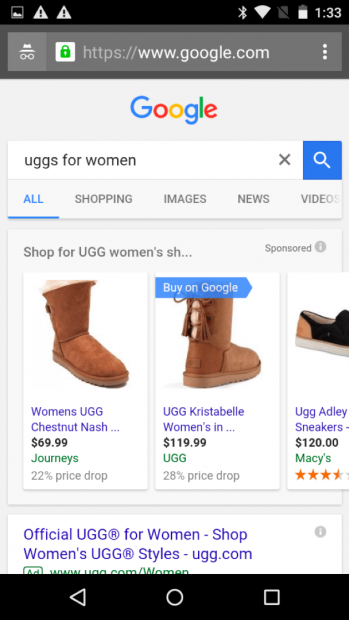 By creating a Google Shopping Actions ad that targets keywords your customer would use in this research process, you have a chance to inject your brand early in their decision-making process. 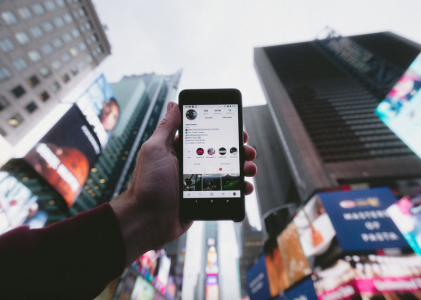 Even if they’re not ready to buy just yet, they’ll be exposed to your brand early on so it will be familiar to them as they evaluate options and make their purchase decision. It also increases your chance of being in front of them when they are ready to make their purchase decision after completing their research. If you need to buy new sneakers, where do you go? Your answer will probably be different from mine, but you likely have a brand or site that pops into mind. Maybe it’s Toms, Amazon, or your local shopping mall. But what if you’re a small brand that isn’t popular yet? How do you attract new customers to your growing business? 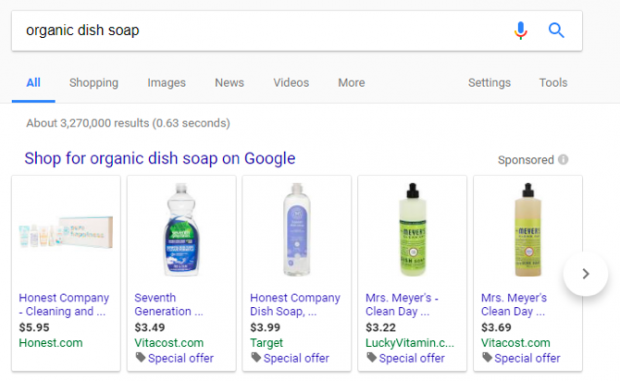 Google Shopping Actions allows your brand to show up at the top of Google’s search results alongside brands you know and trust. People search on Google to get information about where they should be looking, and they trust the top results to be relevant. Marketers can tap into the brand authority in the surrounding real estate. 85% of customers trust online reviews as much as personal recommendations. Google wants to make sure that they are creating a comparative shopping platform to Amazon, so customers feel confident they’re getting the best deal available on the web. Currently, these reviews are pulled directly from the seller’s website, so they’re more helpful if you have an established customer base to leave reviews. Google has recently started pulling reviews from third-party sources for businesses, so there is a chance they could start doing the same here if the program is successful. When that same data was broken down by country, it was clear that this is still a major concern even in developed countries. 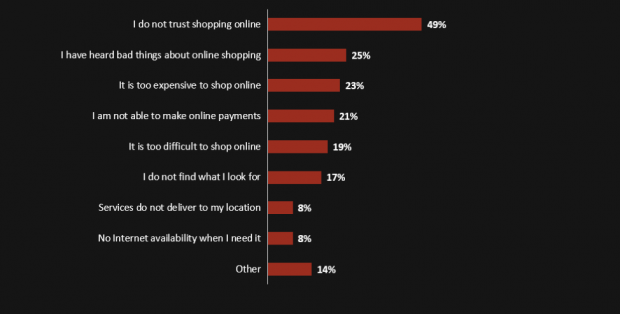 In the United States, 44% of potential shoppers said trust was their primary reason for avoiding online shopping. Millions of people already trust Google with their personal information, ranging from personal documents in Gmail and Drive to credit card numbers in Google Wallet and Android Pay. 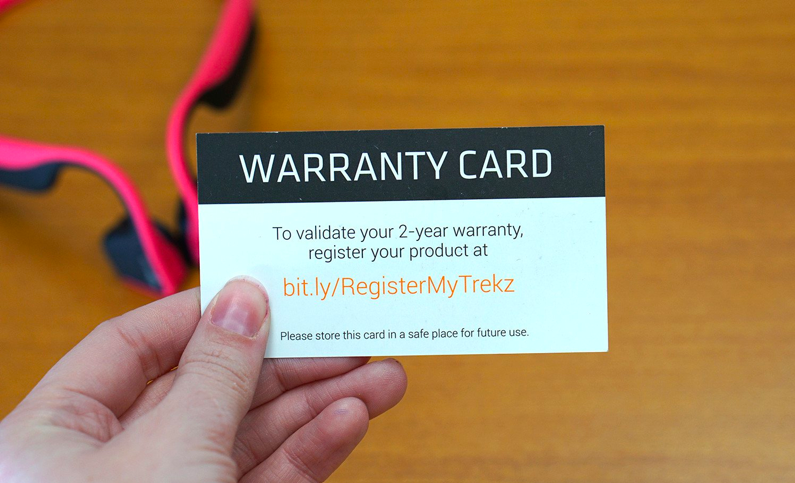 It’s not quite Amazon, since it does expect the customer to work issues out with the merchant directly, but the promise that Google will step in for anything purchased will add an important level of security to shopping. 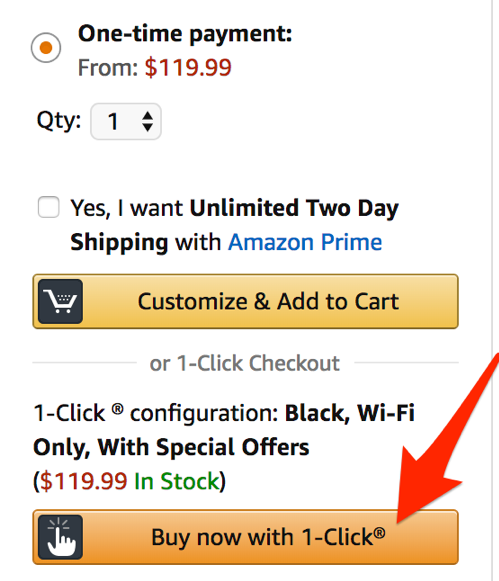 There’s a reason Amazon patented 1-Click checkout back in 1999. 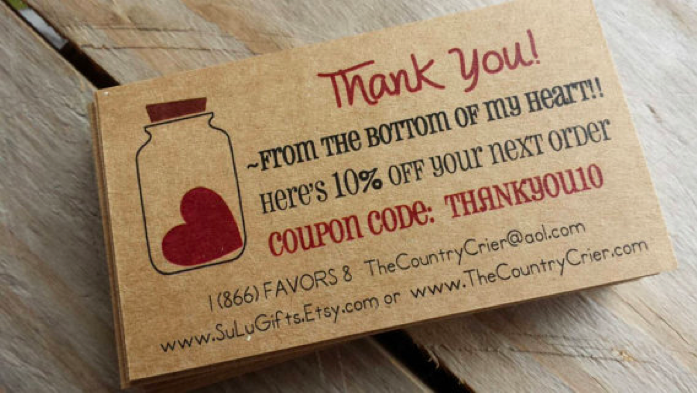 Make it easy for shoppers to give you what you want. Every step in the checkout process is a chance for customers to change their minds. They have to go through the pain of typing their credit card number in and then decide if they really want to part with their money. Amazon makes it so easy to give them what they want. They already have your payment and shipping information stored. Just click that bright orange button, and a new Kindle is all yours. You won’t even notice the $119.99 slip out of your bank account. Promise. For nearly two decades, Amazon had a total monopoly on this concept in the United States. 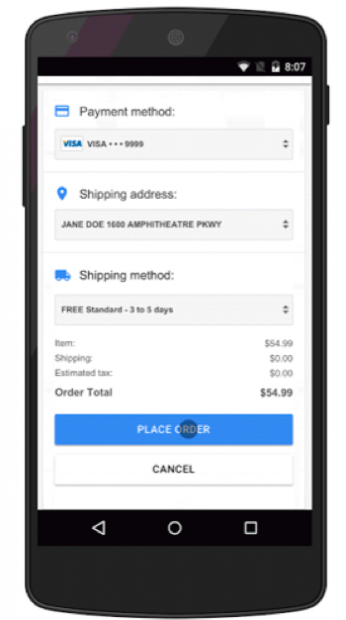 Until last year, it was actually illegal for other e-commerce sellers to offer a checkout process that was only a single click. 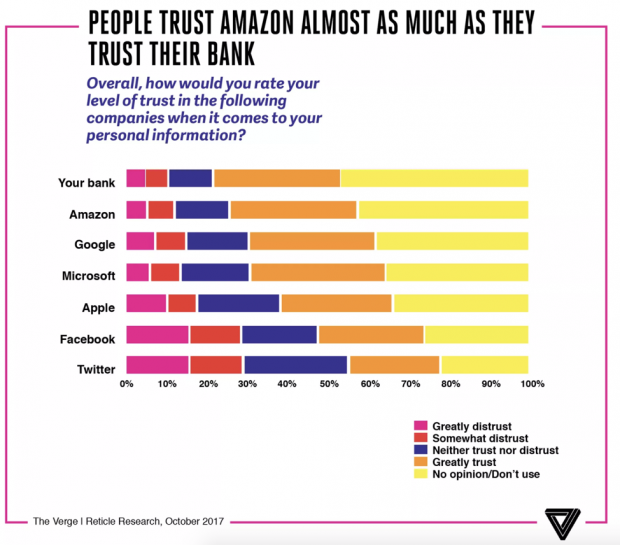 With consumer trust and consumer use already under their belt, Google is addressing other purchase barriers or frictions to make a marketplace on point with Amazon. 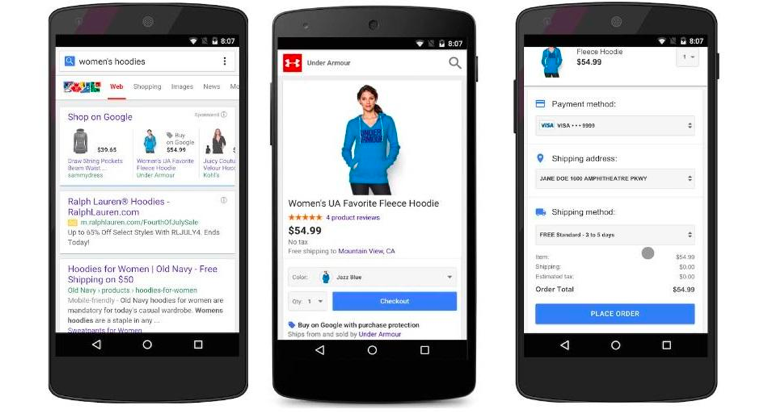 Unfortunately, Google Shopping Actions isn’t perfect. This new marketplace does come with a few drawbacks you need to consider before using it. Specifically, you need to keep in mind that just like with Amazon, Google owns the customer during these transactions and there’s a couple of concerns with that. One of the ways Google is helping establish trust with buyers is by keeping their personal data private. Of course, you’ll be given their address to mail the merchandise, but their billing and contact information will not be shared with you. Additionally, email has such a high ROI – with every dollar spent, your return is $38 on average. Your e-commerce site is probably outfitted with Google Analytics tracking and a Facebook Pixel. You might even use other tools that track different customer behavior like cursor and scroll movement. This information helps you understand customer behavior and use that information to do things like retargeting specific customers who are considering buying from you but might need a little extra push. It can also help you optimize your landing pages and improve your overall marketing to increase conversions. 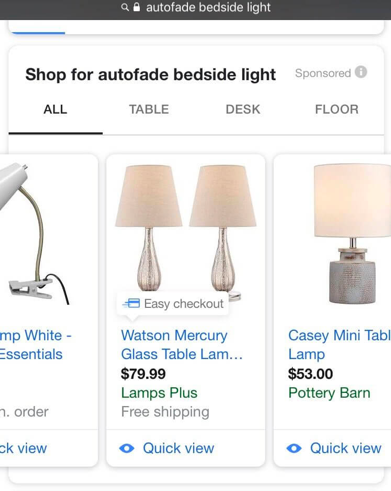 Unfortunately, unless Google updates Shopping Actions to pass this information to you, you’ll be flying in the dark. Currently this marketplace doesn’t share specific click through, time on page or other information you’re used to seeing from your e-commerce store. 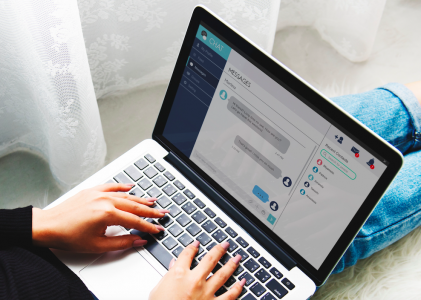 You’ll be missing essential retargeting data necessary to develop buyer segments and recency segments, especially compared to shopping platforms like Shopify and Bigcommerce that share this data. While Google will own the customer relationship like Amazon does, the two are not the same. Unlike Amazon which actually sells products itself, Google is still primarily behaving as a referral advertising source in this transaction. Because of that dynamic, they don’t have as strict policies against marketing materials and nurturing the customer relationship. Amazon strictly prohibits you from sending customers information designed to pull them out of the Amazon ecosystem. That includes anything in your physical shipments that would send customers to visit your site. Both of these strategies help customers find your site for the first time and take action. If you meet their expectations with both your product and services offered, then the next time they’re in the market they’ll be more likely to buy from you directly. And more importantly, you’ll now have their email address to contact them with future offers. 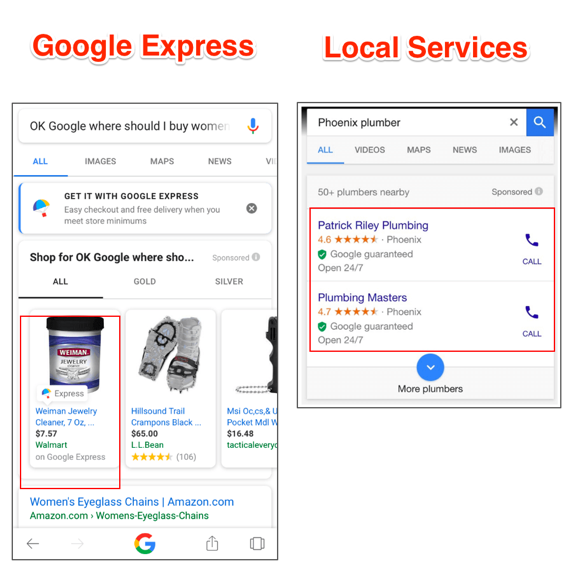 For now, marketers need to be aware of the key differences between Amazon and Google Shopping Actions to adjust their strategies accordingly. 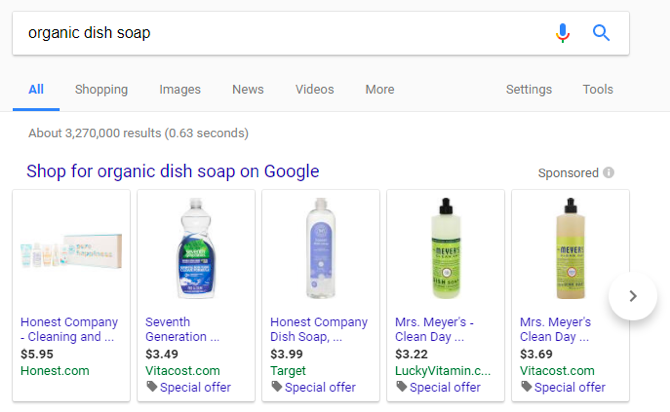 On Google Shopping Actions, marketers should aim to use this channel as an entry platform and then retain customers onsite after that. 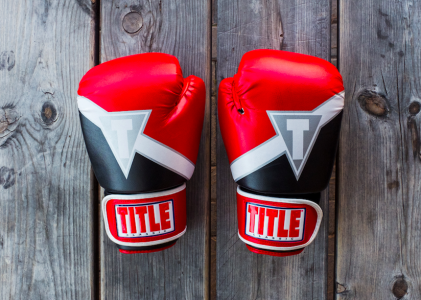 Acquiring customers can be tough as an independent online retailer, especially when competing against giants like Amazon. But you don’t have to give in – you don’t have to accept Amazon’s high fees and restrictive policies! Google Shopping Actions has the potential to give you the same advantages of the titan by lending brand credibility, securing customer trust, and making transactions easy and seamless for buyers, just like Amazon does. Of course, it’s not as great as developing a customer organically, and you won’t have the same remarketing data, but increasing your sales is never a bad thing!Google Shopping Actions gives you a chance to catch the customer’s attention and close the deal in one fell swoop – all on one of the most important pages on the internet. All screenshots by…Taken April 2018.